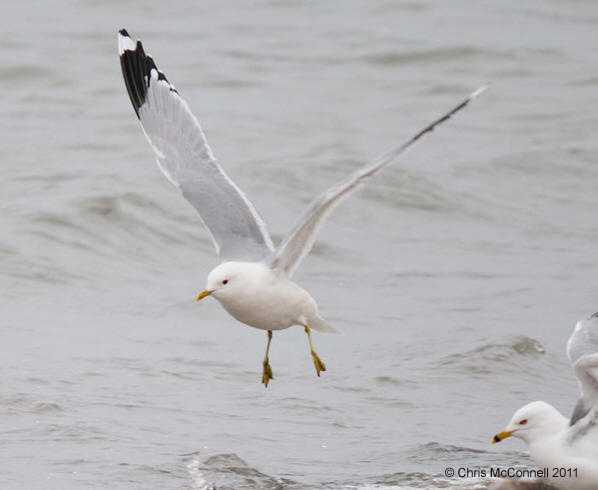 Accepted as Larus canus canus/heinei (Common Gull of Eurasia) by the 2011 Ontario Birds Records Committee. 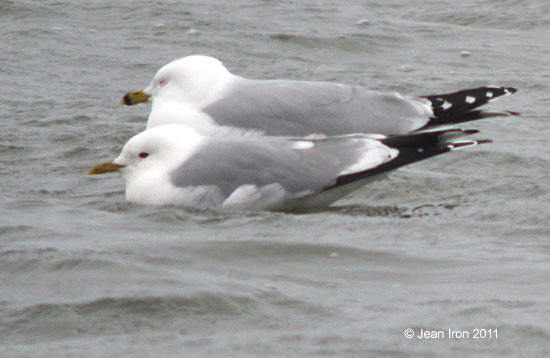 Adult Common Gull in alternate (breeding) plumage at Cobourg Harbour on 23 March 2011. It was smaller than the Ring-billed Gulls and its mantle shade was very close to that of the Ring-billeds. In today's low light, it could not be picked out from the Ring-billeds on mantle shade. Its legs are yellow and there is a hint of a ring on the bill. 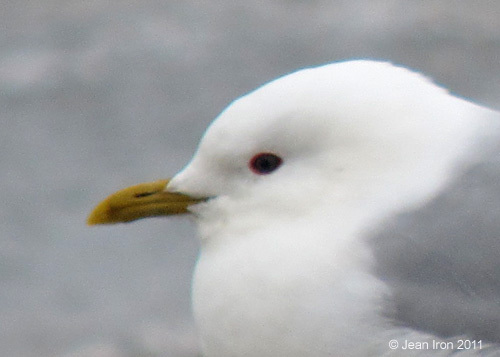 Common Gull at Cobourg Harbour. Spread wing pattern shows Primary 8 is extensively black with no grey tongue reaching a pearl or spot. This pattern is good for Common Gull Larus canus canus. Photo by Chris McConnell. Many thanks to Chris for giving permission to post her photo. 23 March 2011. 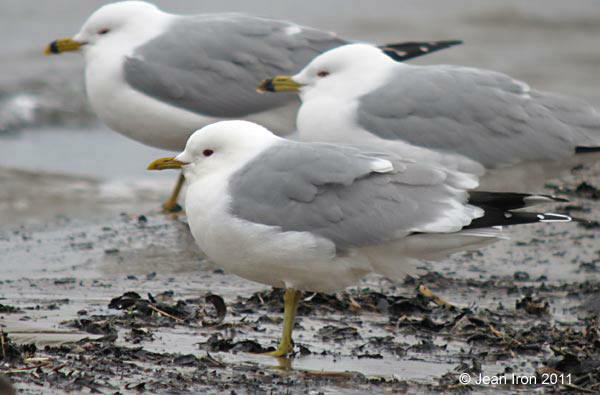 Big mirrors on Primaries 10 and 9 and the amount of black in the wingtips is typical of Common Gulls in Europe. Common Gull at Cobourg Harbour on 23 March 2011. Photo by Bruce Parker. Note: Spread left wing shows P8 is extensively black with no grey tongue reaching a pearl or spot. 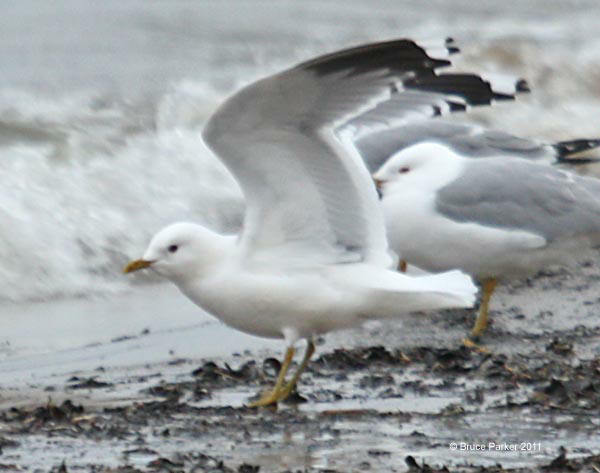 The small white subterminal mirror on P8 occurs occasionally in Common Gull but I could find no cases in Mew Gull. Please see references and photos: Olsen and Larsson page 72 describe Common Gull: “A small proportion with 10-13mm white mirror on P8, mainly on inner web.” Also, Birds of the Western Palearctic page 800, Howell and Dunn page 134, and Grant page 55 and 217 say that the white mirror on P8 occurs in Common Gull only. Common Gull with Ring-billed Gull. Cobourg Harbour on 23 March 2011. It had a vermilion red orbital ring and its eyes were dull brown. The bill was yellow with an indistinct dusky subterminal ring. Cobourg Harbour on 23 March 2011.